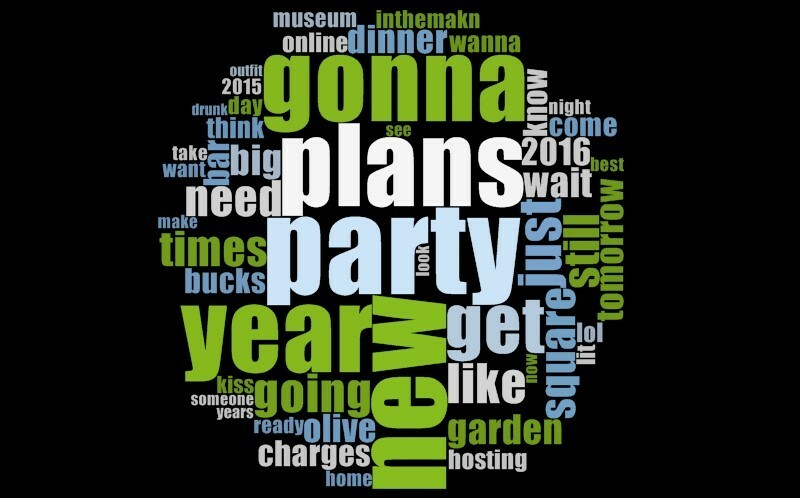 The biggest and most apparent theme is that of partying: New Year’s Eve is one of the (if not THE) most festive holidays of the year, so no wonder the Twittersphere is talking about party plans! Given words like “dinner,” “kiss,” “drunk,” and “bar,” one can infer that many peoples’ plans will involve some bubbly, hosting festivities at home, and someone to share a kiss with when the clock strikes twelve (a NYE tradition). Times Square in New York City is also featured, highlighting the city landmark as a mecca for NYE festivities. In addition, The Olive Garden, a popular Italian chain restaurant in the US, is also trending within talk of NYE: the Times Square branch is charging $400 to party at the restaurant, and will not be including breadsticks! We hope all of our readers have a Happy New Year!